Probably the biggest hype of the year: the release of Rihanna's makeup line Fenty Beauty. I must admit, when I found out that Fenty Beauty launched at Harvey Nichols on 08 September, I placed an order straight away and for two reasons: because I was curious to find out what all the fuss was about, but also to see if people were buying these products because Rihanna has her name on it or if the makeup is actually worth the money. Rather than just giving you my opinion in a review, I decided to take a slightly different approach and do a bit of a comparison to cheaper drugstore products. 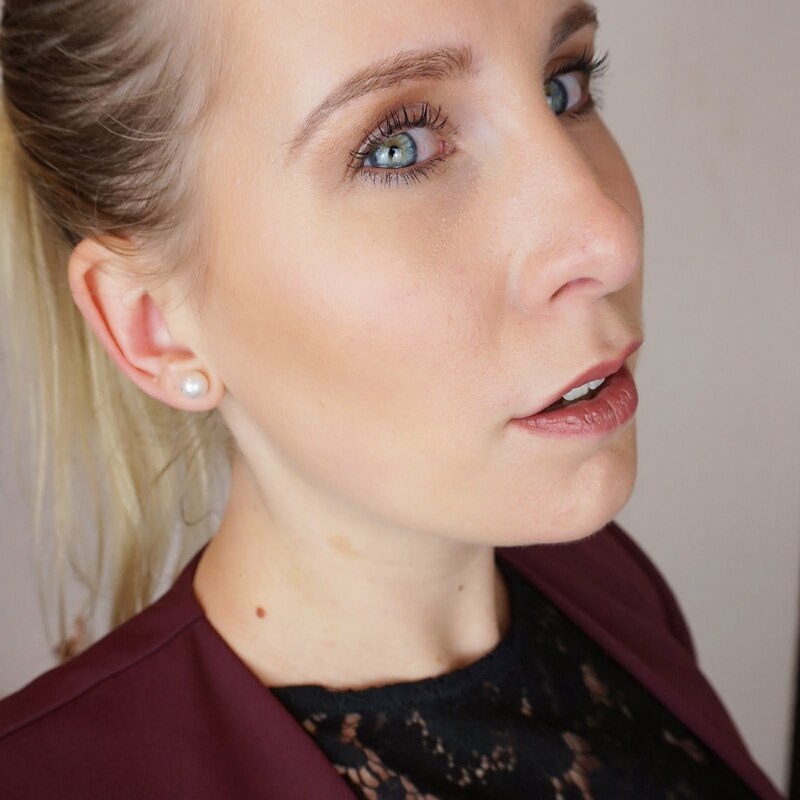 For this blog post I have got the Fenty Beauty Match Stix Trio in light, and the Contour Stix trio from drugstore brand Technic. Both are a set of a concealer, contour and highlight for light skin tones. The first thing I notice, is the packaging. It is very noticeable that a lot more thought has been put in the Fenty Beauty packaging. Although Technic has produced the very useful, yet standard crayon size, Fenty has taken it a step further with geometric shapes, thick handles that are easy to hold and in a pale pink colour which is totally on trend. The sticks are also magnetic which Rihanna designed that way to make it easier to take the sticks on travel and find back in your bag. Without swatching, the concealers look similar at first, but when swatched, I can see that the Technic concealer is a lot lighter. Both concealers apply easily, but I note that the Technic concealer is a lot creamier, and I do wonder if the formula is suitable for my combination skin. Both concealers blend quite nicely into the skin, but the Fenty looks much more natural when blended. After blending in, I find that the Technic concealer feels sticky and slightly greasy whereas the Fenty concealer is not sticky at all and feels very light weight. The formula of the Fenty concealer feels a lot more wearable compared to the one from Technic. I am not going to lie, contouring is something I have only recently gotten used to. Initially I was not a big fan, mostly because I have seen many people overdo it. However I can now appreciate it a bit more, especially when it is done well. There is such a fine line between adding a slightly darker shade where it's meant to be added and looking like you've got mud on your face, and I definitely don't always nail it but I try! For these two contour sticks, there is a massive difference in colour. 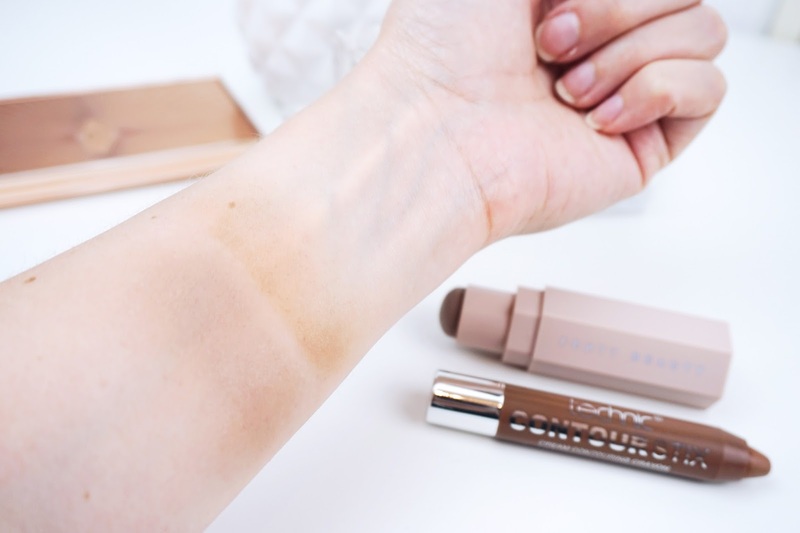 As you can see in the swatches, the Technic contour stick looks very warm, almost orange brown. Not my thing at all and it reminds me of fake tan. The Fenty Beauty one on the other hand is a much cooler shade of brown, and much more wearable in my opinion. Again, both apply easily but the Technic stick does not blend half as easy as Fenty Beauty. The Fenty Beauty contouring stick blends evenly and contains a lot of pigment. 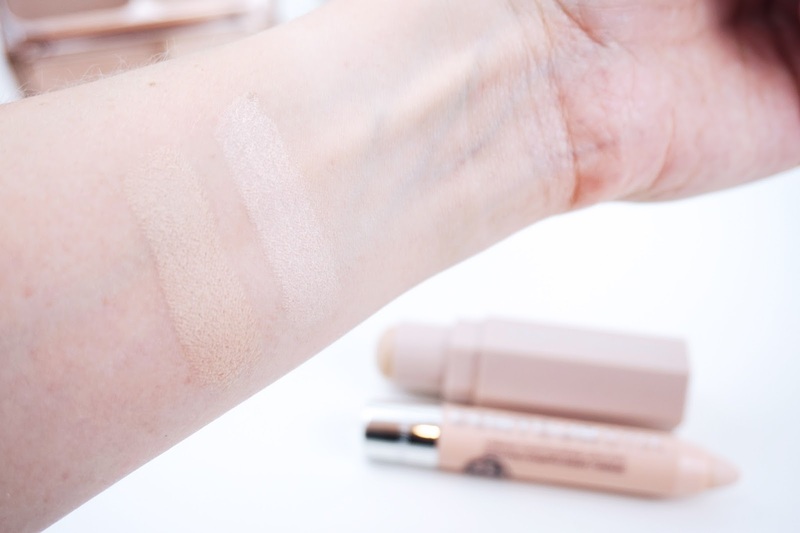 When I blend the contouring stick from Technic, it does not appear to blend evenly and the shade turns very light, losing a lot of the pigmentation I originally thought was there. 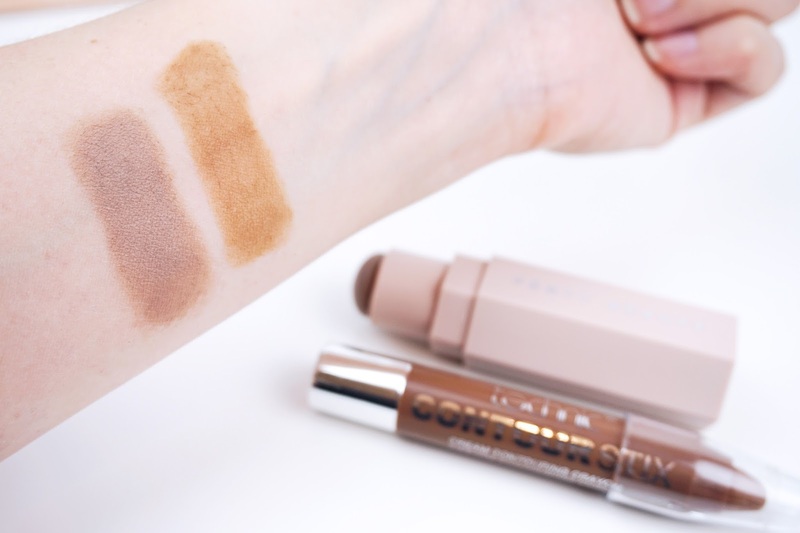 As with the concealer, the Technic contouring stick is creamier and leaves a slight greasy feel compared to the light weight formula of Fenty Beauty. Last, but not least the highlighter sticks. 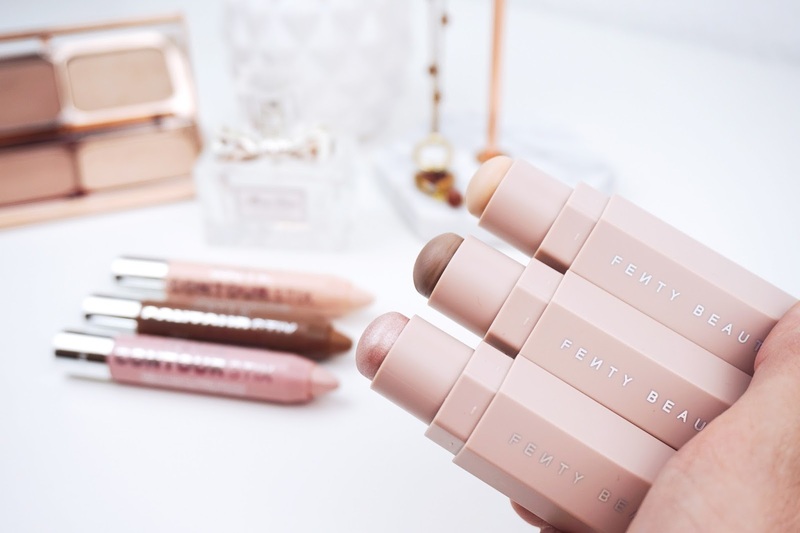 The colour of the Technic and Fenty Beauty sticks are very similar. The main difference lies in the shimmer. Oh my goodness, the Fenty Beauty highlighting stick is absolutely full of it and so gorgeous! I remember when I first tried the Technic highlighter. I thought it looked quite good, but it does not compare to the Fenty Beauty one at all. Once blended, this becomes even more clear. 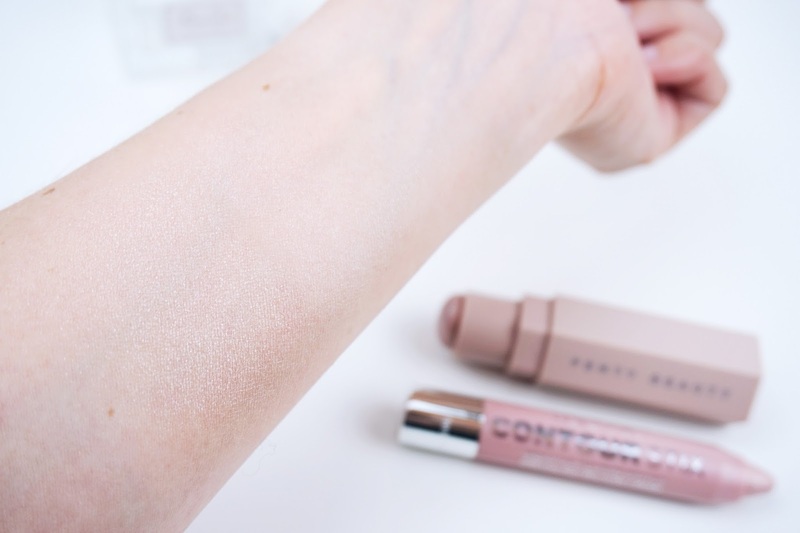 The Fenty highlighter leaves a gorgeous even layer of pale pink, shimmery glitter, whereas the Technic highlighter almost disappears into my skin. I can just about identify a bit of shimmer, but it is definitely not as apparent as Fenty Beauty. The creamy texture makes the Technic highlighter slightly more difficult to blend evenly. The Fenty highlighter feels textured and almost as if it turns into more of a powder. Comparing Technic to Fenty Beauty, one of the biggest differences between the two is the longlasting formula. The Technic sticks are quite creamy. 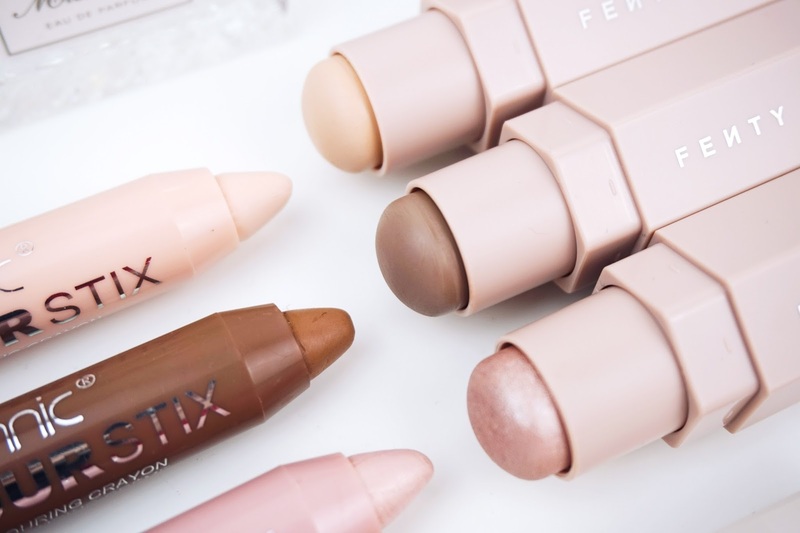 The Fenty Beauty Match Stix are more matte and feel more powdery. This makes them very suitable to my combination skin and throughout the day, I have not had to worry about the product moving anywhere. Because of the creamy texture of the Technic sticks, that formula did not last half as long on my skin. I must add however that although the Fenty Beauty concealer and contour stick last really well throughout the day, the highlighter fades and is less longlasting. As you can probably tell from the information above, I am a big fan of the Fenty Beauty Match Stix. I believe the formula of the sticks is great and although it is linked to a celebrity, I do not feel that that's all there is to it. 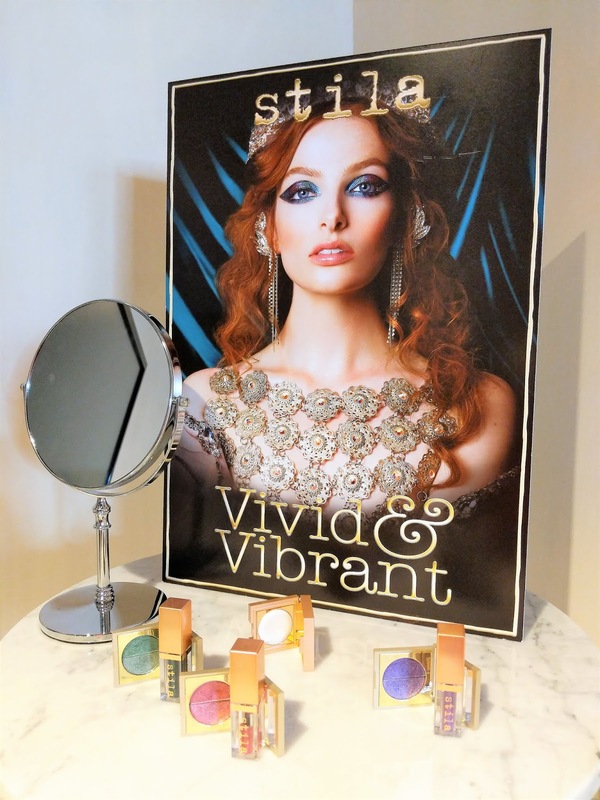 The sticks are lightweight, highly pigmented and longlasting. The products do really offer good value for money. I appreciate that I am comparing two brands that are on completely opposite ends of the beauty spectrum - Technic being on the lower end of drugstore products and Fenty Beauty being a high end luxury brand. I am sure that there are reasonably priced brands out there that would be more comparable, however I do think the same point is proven, that sometimes it's worth spending the money rather than trying to save it. The Technic Contour Stix are cheap and cheerful. You do not pay much for them (the set is generally available for less than £5), therefore your expectations might not be high either. 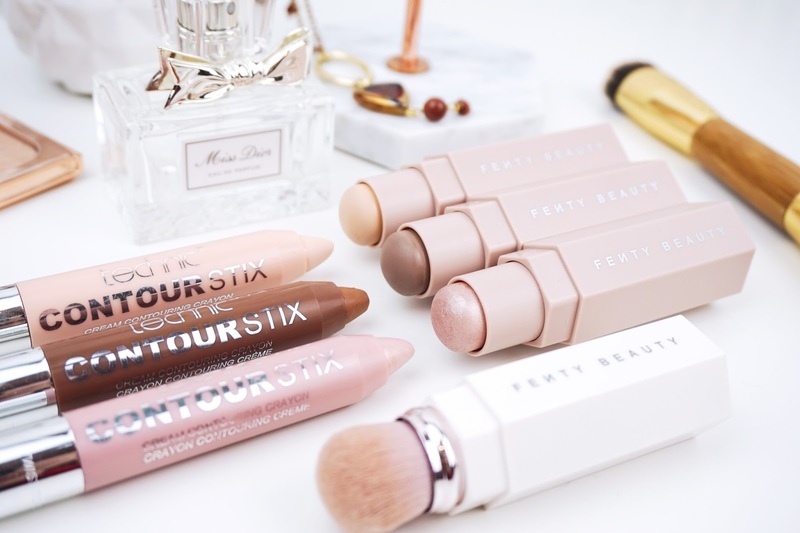 With Fenty Beauty, you do have to spend a bit of money (the Match Stix Trio comes to £46), but are definitely a good investment if you want more from it than just a quick fix for a night out. Thank you for reading! I hope you have found this review useful. 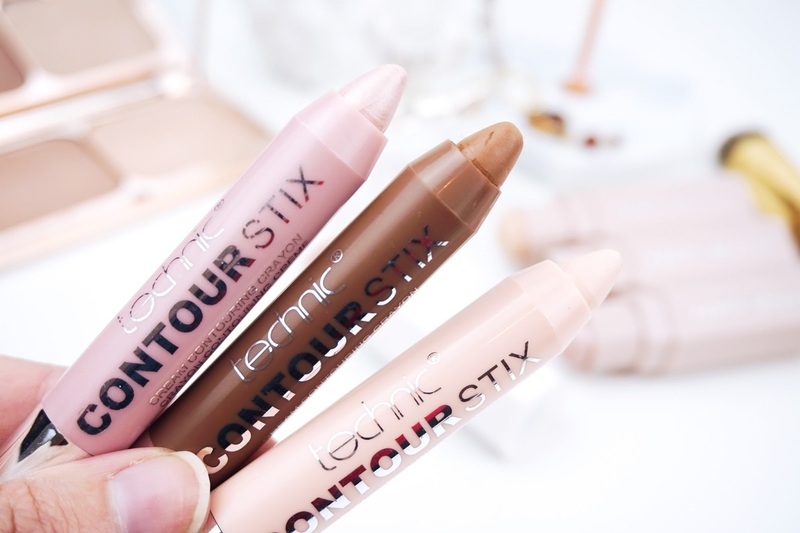 You can find the Technic Cosmetics Contour Stix in your local drugstores in the UK. The Fenty Beauty Match Stix Trio is available at Harvey Nichols or at Fenty Beauty in the US. 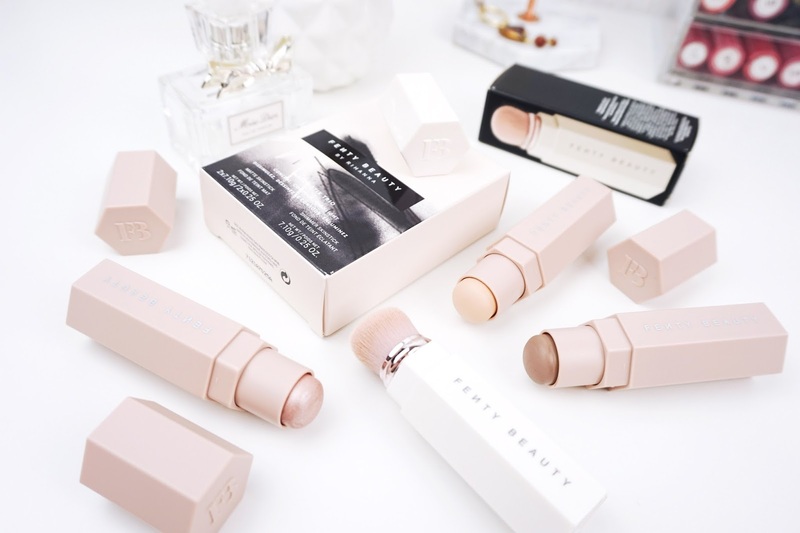 Have you tried any Fenty Beauty items? I would love to hear your thoughts on them, so please feel free to leave a message below! I went into Sephora to swatch Fenty Beauty and unfortunately I find the powder highlighters were a touch too much for me. I do like the sticks though but I already have way too many so I decided not to buy anything from the brand for now.